This week: A few opportunities and important reminders as the semester winds down. Still looking for summer internship/volunteer opportunities? Join our Facebook page and use the search box to find all kinds of internship and volunteer opportunities that we’ve posted. We also posted lots of opportunities over on our Compass page! TOMORROW is the deadline to register for the June LSAT! Remember that if you are requesting accommodations you must also submit that request and supporting documentation by tomorrow as well. Requests for testing accommodations are due by the receipt deadlines below. All receipt deadlines are by 11:59 pm Eastern Time (ET). For more information about the June 2018 LSAT, visit the LSAC website. Career Center–You can still get your resume reviewed, meet with a career advisor, and learn more about applying for Peace Corps this week. Check out the Career Center’s calendar of events here. If you are still looking for a summer 2018 internship, here are over TWENTY job postings for summer interns across the country and Illinois! Freshmen, Sophomores, and Juniors can all apply. Chapman & Cutler is a large law firm in Chicago that is looking for an intern to be a part of their Administrative Intern Diversity Pipeline Program. Applicants are asked to rank the following departments based on level of interest: Business Operations, Human Resources/Recruiting/Professional Development, Office Services/Facilities, Records Department, and Selection Criteria. Applicants will be considered based on their academic achievements, leadership abilities, community service, oral and written communication skills, and a commitment to and support of diversity and inclusion in the areas of racial or ethnic diversity, gender identity, sexual orientation, disability or other areas of underrepresentation or otherwise important diversity in the legal profession. Consistent with our broad and inclusive view of diversity, Chapman and Cutler LLP will also consider additional criteria, among many other factors, such as military experience and demonstrated ability to overcome adversity, such as first-in-family college attendance or socioeconomic disadvantage. Applicants must have completed at least one year of undergraduate studies to be eligible for consideration and have at least one year of undergraduate study remaining. The United States Bankruptcy Court for the Eastern District of New York is looking for college interns for their Brooklyn, NY and Central Islip, NY courthouses. The application is due May 16! PAID internship. For a student that is a business analytics, mathematics, statistics, or related major. If you are interested in government work in Illinois, check out our Compass page for 13 government related (State’s Attorney’s offices, Public Defender’s offices, etc.) opportunities across the state of Illinois. Together with Community Initiatives staff, the Lead Interns will support the development, delivery, and maintenance of science education programs. The delivery of the science education programs may include (but not limited to) museum guests, visitors, community and school audiences. KCBS2/KCAL9 TV, the CBS Owned & Operated Duopoly in Los Angeles, is looking for an Investigative Intern. Participating in the Internship Program you will have the opportunity to experience how a major Broadcast News station runs the News Investigations Unit. There will be opportunities to witness and take part in day to day activities. Internship programs are for approximately 12 weeks and concludes at the end of the semester. Chicago Tonight is a multi-faceted news and current affairs program broadcast in prime time (7-8 p.m.) Monday – Friday. The program includes news analysis, interviews and other current features, film and theater reviews and commentary. It combines in-studio interviews and features, with pre-produced field packages and remote live shots. Chicago Tonight is unlike any other news program in the local market and a unique daily format among PBS stations nationwide. Today is the last Pre-Law Advising Services event of the semester! If you’re planning to apply to law school this fall OR if you’re graduating and planning to apply to law school in the next couple of years, then this is a great opportunity to learn about writing a personal statement for law school. The personal statement is a critical part of the law school application in which applicants must show personality, highlight strengths, identify career goals, and address why law school is their next step: a tall order for a 2 page document! We’ll have time for Q&A, so bring your questions! Job Opportunity for UIUC Seniors and Recent Graduates – DEADLINE IS APRIL 25! Proskauer, a large international law firm with offices in multiple locations, is looking to hire Project Assistants to start working this summer for the following offices: New York City (Corporate only); Boston and Washington, D.C.
Project Assistants are recent college graduates who are looking to gain exposure to the legal field before attending law school. They possess excellent written and oral communication skills, critical thinking abilities and are detail oriented. These qualities allow them to effectively support lawyers and more senior paralegals on a wide range of projects and tasks with appropriate supervision. Practice areas for Project Assistants include corporate, litigation and labor. Candidates must be willing to make a two-year commitment and be available to work the hours required by a leading law firm (including evenings and weekends). Successful candidates will be placed in specific practice areas based on the firm’s needs. To learn more about the Project Assistant positions, go here: https://www.proskauer.com/careers/paralegals. Interested UIUC seniors and alumni applicants should submit their cover letters and resumes to Judy Argentieri, Pre-Law Advisor, UIUC at: jargenti@illinois.edu, by Wednesday, April 25, 5:00pm. Deadline for the June 11 LSAT is approaching! 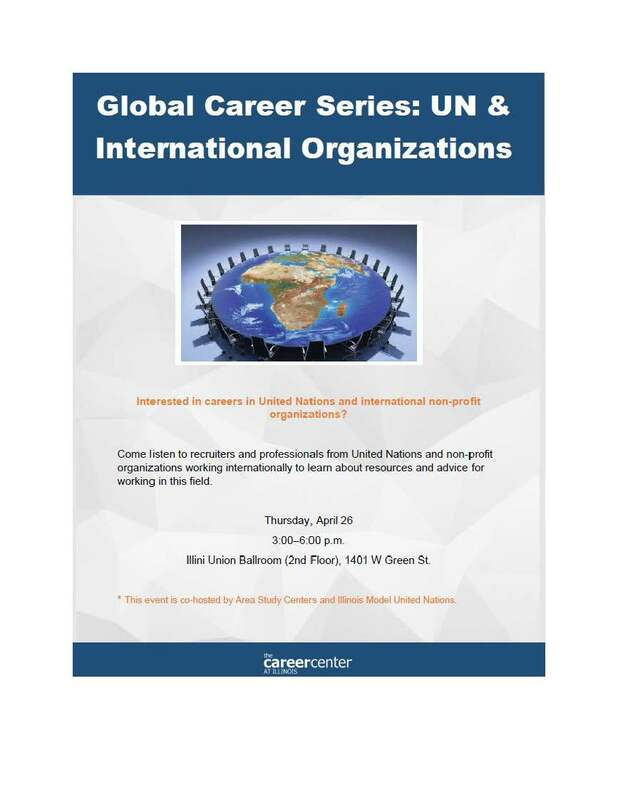 Interested in a career with the United Nations or international non-profit organizations? 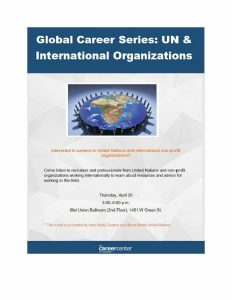 The Area Study Centers and the Illinois Model United Nations is co-hosting this event to learn more about resources and to get advice about working in this field. Need a study break during finals? Check out the Union’s Calendar of Events for the rest of the school year. For more information, click here. The Annual Feminist Film Festival is a grassroots event that uses art and alternative media to bring social issues to the fore. The goal of the festival is to showcase independent film spanning documentary, narrative, and experimental genres in order to explore perspectives often missing from mainstream media and culture. The festival strives to serve as a space for underrepresented artists and filmmakers to raise consciousness concerning issues related to gender, race, class, sexuality, ability and other dimensions of social identity. The University of Illinois Annual Feminist Film Festival is organized and hosted by the Women’s Resources Center, in collaboration with a variety of campus units and departments. For more information, click here. Still looking for a summer 2018 internship? Applying for full time jobs? Maybe your resume needs a second look! The Career Center offers resume reviews at different locations across camps. This is a great way to get feedback on your resume without having to schedule an appointment. Please bring a paper copy to the location of your choice. This is a FREE service provided by the University. Monday-Friday, 2:00-4:30pm: The Career Center, Resource Center 715 S Wright Street (Across from the Alma Mater). Tuesday, 5:30-7:30pm: The IKE 301 E Gregory Drive (in Room 1010A). For more information, visit the Career Center’s website. Although we have less than a month to go in the semester, Pre-Law Advising Services has two important workshops — TODAY and next Monday — for those of you planning on applying to law school this fall. Scroll down for information about these programs, study groups for the September LSAT, Fulbright Scholarships and more, including a campus visit by noted attorney and civil rights advocate Alan Dershowitz! And we will allocate time for Q&A. Join us to get a head start on fall applications or to find out what you can do to maximize your applications during a gap year. All students and alumni are welcome! Resume, Cover Letter, Linked In Reviews – Monday, April 16, 2-4:30pm, Resource Center; 7-9pm, Undergraduate Library, Consultation Corner. This workshop is offered several other times during the week. Go here for more information. International Student Career Meet Up – Friday, April 20, 4-5:30pm, The Career Center Interview Suite Room 213. Join us for an information gathering where international students can talk with alumni, recruiters, or current international students who have successful job search stories. Information on invited speakers will be posted on Handshake. Open to all international students, but RSVP on Handshake is required due to a space limitation. For more information on these and other Career Center events, check out their website. Sound interesting? The National & International Scholarships Program has several workshops scheduled to help you prepare a strong application. Friday, April 20: Personal Statement Workshop – 3:30-5:00 pm, 514 Illini Union Bookstore. A key part of the Fulbright Application is the Personal Statement, a one-page essay. Come learn how to create this document and tell your unique story. If you are not currently on campus to take advantage of our Fulbright Information Session, join us remotely for these webinars! The same detailed overview will be provided for the Fulbright U.S. Student Program, including: eligibility, grant types, and application advice. There will also be plenty of time for questions and answers. Friday, April 27: English Teaching Assistant (ETA) Application Workshop – 2:00-3:00 pm, 514 Illini Union Bookstore. The Fulbright ETA application includes a one-page essay on your case for Why the Fulbright program should fund You to Teach English to students in ____________ (insert your host country). We will discuss how to approach this essay and more during this workshop. Friday, April 27: Designing a Fulbright Research Proposal Workshop – 3:30-5:00 pm, 514 Illini Union Bookstore. If you are interested in applying for a Fulbright research grant, join us for this workshop to learn how to craft this important two-page grant request, how to secure a letter of affiliation, and how to select your reference letter writers. Facebook UIUC Fulbright Events page is here. Alan Dershowitz, noted attorney and advocate for civil rights and civil liberties, will be on the University of Illinois at Urbana Champaign campus next Thursday, April 26, 2018, for a series of events. The day will culminate in a public lecture held in Foelinger Auditorium, at 7:30pm. This even is FREE and open to the public! This visit is sponsored by Gies College of Business; The Program in Constitutional Theory, History and Law at the College of Law; and the Chabad Center for Jewish Life at the University of Illinois. The deadlines for seat deposits at law schools are rapidly approaching. It’s time to decide where to attend law school! In many cases, these decisions prove difficult. Scholarships, living expenses, geographic locations and other considerations all play a part in the decision process. Here are some tips and suggestions to help applicants through the seat deposit process. Reconsider the Right School/Wrong School Mentality. Many applicants see their choice of law school as a Right/Wrong dichotomy. They feel pressure to pick the Right law school so that everything will be wonderful and life will be perfect. They worry that if they pick the Wrong law school, life will be miserable and they will spend their days regretting it. It is more accurate and helpful to approach this decision by acknowledging that there is no one perfect law school for everyone. A better question is: What is the best school to help YOU achieve YOUR PRIORITIES? Every law school will have strengths and weaknesses. Your job should be to consider what your priorities are in a legal education, and to choose a school that matches those priorities. Note that here is where it is important to focus on YOU and not what Mom/Dad, significant others, family, friends, etc. think. You are the only person who can decide which law school is right for YOU. Reconsider your priorities. When considering schools to apply to, we asked: What are your priorities in a legal education? Think back on that pre-application priority or ranking. Some priorities to consider or reconsider include: Where do you want to live and practice after law school? What specialty programs does this school offer? What observations did you make about the law school when you visited? What would your overall investment be (see more on that below) to attend this school? If you’re waitlisted–deposit somewhere or decide to reapply next year. If you are waitlisted at Dream School and hoping that comes through, you must make a careful decision about where else you will deposit. OR you can decide to take your chances with Dream School and reapply to law school next year if you don’t get in from the wait list. However, don’t decide to put no deposits down and expect to attend law school this fall–being wait listed is no guarantee of admission and once the seat deposit deadlines have passed you have forfeited your seat even where you were admitted. If you are still undecided, it’s better to put down a seat deposit and lose that money (if you decide not to attend or get into Dream Law School off the wait list) than have no seat in any law school class this fall. Submitting multiple seat deposits is a tricky business. Law schools will see all of your seat deposits as of May 15, some schools can retract your offer of admission, the practice is costly and borderline unethical, and it only prolongs the decision process. You have done all the hard work to receive these offers so take the last step and make your choice. Embrace your choice. You visited, you calculated all the data, you weighed all of your priorities, you thought it over, you talked to law school professionals and students. You made the decision that you decided best suits your priorities. Once you have made that decision, it is time to embrace it and to let go of the “what ifs” to focus on your next steps. You’ll want to take advantage of every opportunity, program, and connection your law school offers to maximize your law school experience. Enter law school with an open mind and embrace all of the opportunities wherever you decide to attend. Upcoming Pre-Law Advising Services Events: Are you planning to apply to law school this fall? Or maybe you’re graduating and planning to apply within the next year or two? These two upcoming workshops will help you maximize your summer or your gap year to make your law school application the best it can be. Join us for one or both. Undergraduate Law Review Meeting–Are you interested in legal writing? Join the first meeting for the very first undergraduate law journal at the University of Illinois on Monday, April 16 at 6pm in Greg Hall Room 215. LSAT UPDATE–Are you planning to take the LSAT this summer? Both the June and July exams are open for registration here. We recommend registering ASAP to get your preferred test location. FALL 2018 COURSES – Still building your fall schedule? Refer to this blog featuring a detailed list of suggested Fall ’18 classes for pre-law students. Reminder: The University of Wisconsin Pre-Law Undergraduate Scholars program application is due this Friday, April 13. Click here to learn more and apply. Still looking for summer opportunities? We’ve posted lots of internships, jobs, and volunteer opportunities over on our Facebook page. And don’t forget about the Illini Career and Internship Fair, Tuesday April 10, 1pm-6pm, Illini Union Rooms A, B, and C! This career fair is open to all disciplines and is designed to serve as a “just-in-time” fair for students that have yet to secure a summer internship or full-time job after graduation. Click here for more details. A Conversation with Alan Dershowitz, noted attorney and advocate for civil liberties, will be held on April 26 at 7:30 pm at Foellinger Auditorium. Click here for more details. The College of Law will host Discussion of “Unequal: How America’s Courts Undermine Discrimination Law” on April 19 at 12:00 pm in the Rowe Auditorium. This event is free and open to the public and lunch will be served to attendees. Find more details here.